Harmful Coliform and E-coli Bacteria Treatment and Filtration in Well Water Systems. Coliform and E-coli are harmful bacteria sometimes found in well water. If your well has tested positive for either of these harmful bacterium in ANY amount, we strongly recommend that you treat it. Whether you have a private well, a community well or a commercial well we can help with effective well water treatment systems and solutions. There are a several different ways to treat and filter your well water for these harmful bacterium. Chlorination - This would include a chemical feeder and at least one retention tank to kill coliform and e-coli bacteria. UV Filtration - Sterilization light to kill harmful bacteria. Keep in mind that many people cannot use this method without first filtering and softening the water due to "Shielding" concerns. Beware of companies who will let you add this UV technology on hard water or on water with iron or any other type of sediment issues such as sand, manganese, clay, dirt, turbidity etc. Feel free to contact one of our expert techs with your test results so we can help you determine if a UV light alone will be a correct application. Open Air requires no additional pumps, retention tanks or other products to kill harmful bacterium and can even increase the water pressure for homes with low pressure systems. 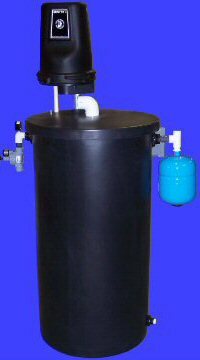 It is a bit more expensive but is ideal for people with low water pressure or limited space where they can't possibly use retention tanks. We would also recommend that you have your water tested for iron, hardness, TDS and pH at the very minimum. You will find suggestions on how to have this done under item number 16 on the same page as the flow rate instructions. We even tell you how you can get this testing done for free. If you need to test for e-coli or coliform, the best thing to do is call the local county health department in your area for advice on the best way to get testing. Sometimes they do it for free or at a low cost. Also a lot of local municipal water suppliers that sell city water will test as a community service for people not on the local municipal supply. Chlorine injection means we are injecting chlorine directly into your water line using an inexpensive chemical feeder pump to inject water right into the water line and then into a retention tank(s). You will need a large enough retention tank(s) in order to give the chlorine 20 to 30 minutes contact time with your water. To get the proper amount of contact time you will need a minimum of 20 gallons of storage for every 1 gallon per minute flow rate. The recommended retention tank size in most cases is a 120 gallon Retention Tank ($449). They stand 5 feet tall and 2 feet wide. You will need one tank for every 6 gallons of flow rate as determined by the flow rate check instructions below. Example: For 6 gallons per minute flow rate you would need a 120 gallon retention tank. 6 GPM x 20 minute contact time = 120 gallon retention tank. The open air system combines chlorination and aeration in the same equipment. This type of coliform and e-coli treatment also works well to eliminate or greatly reduce iron and iron bacteria. The combination of aeration and chlorination creates a powerful oxidizer and sanitizer. The open-air system will also remove: sulfur, sulfur decaying bacteria, black manganese, algae, tannins, methane and radon gas, low output well and low pH. This can be ordered with either a 100 gallon or 250 gallon tank to give enough contact time. We would recommend that you follow this application with a backwashing Terminox™ I.S.M. filter. UV is an effective way to treat coliform and e-coli. Normally you may have to treat your water for other impurities such as hardness (calcium, magnesium), iron, sediment and manganese prior to UV treatment. If you have impurities other than coliform and e-coli, these impurities can cause "shielding" of the bacteria. Shielding is where the bacteria can hide behind other particles and be unaffected by the UV treatment. We would recommend that if you have greater than 0.2 ppm of iron or greater than 5 GPG of hardness that you treat your water before the UV lamp. You will need to determine your flow rate to determine which UV system is right for your specific application. Beware of companies who claim the UV alone can kill bacteria with no pre-treatment at all or who don't require specific testing for hardness, iron, manganese, dirt, turbidity, clay and other forms of turbidity or sediment related type contaminants. *These models include elapsed time meters, alarm resets, lamp replacement meters and dry contacts. Deluxe models include a new UV intensity monitoring device for added safety. NOTE: Some pictures may vary slightly from the actual product. For the person who wants an application that is "extreme" overkill and doesn't mind spending more money to protect themselves in several different ways. The most effective way, for that person who wants to be virtually certain that they are getting the most effective bacteria treatment; would be to use a chlorine injection with 20 to 30 minutes of contact time. Followed by ultra violet treatment and then a reverse osmosis at the point of use for your drinking and cooking water. Although this is the most precise method, in most cases either chlorine injection-retention or ultra violet treatment followed by a reverse osmosis is more than sufficient to effectively treat e-coli and coliform bacteria. Please do not hesitate to call one of our expert techs. Our phone is answered 24 hours a day at 800-684-0979. We DO NOT work on commission and our techs are never allowed to ask you to buy anything. We just answer your questions and give you great advice. Even if you never buy anything from us we can help you analyze your situation so that you know exactly what you should do and what it should cost. This can protect you from those in home slick talking commissioned salespeople who act like they are experts. They are simply commissioned salespeople who raise hungry kids if they don't get a BIG sale from unsuspecting homeowners TONIGHT! Also remember we have a private installation website complete with "How To" instructions to easily guide you through installation. We also have free 7 day lifetime tech support to assist you with any question you may have along the way. Even on holidays! We won't let you mess it up! Do you want it installed for you? No problem. We can certainly recommend an installer in your area. Of course remember that ANY plumber or handyman should be able to do this quite quickly and easily. We can even show you how to prepare the area so that all they need to do is plumb you in and leave, making their cost far more reasonable. And just about everyone knows someone who is reasonably handy, even if they have never plumbed anything before. If you have a handy friend who will do it for a free meal get him in touch with our techs and we can walk him through it as well. You would be surprised how many housewives have installed equipment using our expert help and advice.